Some dream of a white Christmas... but not the people who are thinking of spending their holidays in Tenerife. They are dreaming of a warm and sunny Christmas and if you're reading this, you're probably one of them as well. The Canary Islands are blessed with the warmest weather in Europe during the winter months, so if you're wishing for some winter sun the Canaries are the place to go. Temperatures in December and January in Tenerife South still rise around the 23 - 25 Celsius during the daytime, and at night it gets a bit chilly, but a cardigan will suffice on most evenings. You can see more photos from Tenerife in December, just so you get a better sense of what you can expect if you decide to spend Christmas and New Year's Eve in Tenerife. Even with the nice weather we still recommend to pack a light coat. On most winter nights you will need one, or at least a cardi, but for the daytime you should always pack a the bathing suit and flip flops. In Spain, Christmas is a bit different from the UK and other countries in Europe. Kids will receive their gifts on the 6th of January, when there's a national holiday known as The Three Kings or Dia de los Reyes Magos. So for Spanish people Christmas is usually a holiday to be spent at home with the family, having a nice dinner together before going to church for the ceremony known as Midnight Mass or La Misa del Gallo. However, since Tenerife is a tourist destination all year round, most of the restaurants, bars and places will be open on Christmas day just like any other normal day. Some of the shops will be closed on the 25th of December, since this is still a public holiday in all of Spain. So if you need to stock up on something you should do your shopping at a day in advance. In the main tourist areas in the South you will still find some shops open even on Christmas day, but big hypermarkets like Mercadona will be closed on Christmas day and will reopen on the 26th. The 26th is not Boxing Day as it's in the UK, instead the Sale Season in Spain starts on the 7th of January, the day after the children get their gifts from the Three Wise Men, otherwise known as the Three Kings. In 2018 a Christmas Market with more than 30 stalls will be opened between 30 November and 13 January 2019 in Puerto de la Cruz. Schedule: from Monday to Friday from 5 pm; Saturdays, Sundays and holidays from 12 pm. See more details in the Christmas Program in Puerto de la Cruz, with all the activities planned for the month of December. Most of the restaurants in Tenerife will prepare a special meal for Christmas day, either with a set menu or a buffet. Some restaurants get fully booked for next year right after the present year's Christmas dinner has ended, since many of the visitors are return customers who come here each year to spend their holidays. 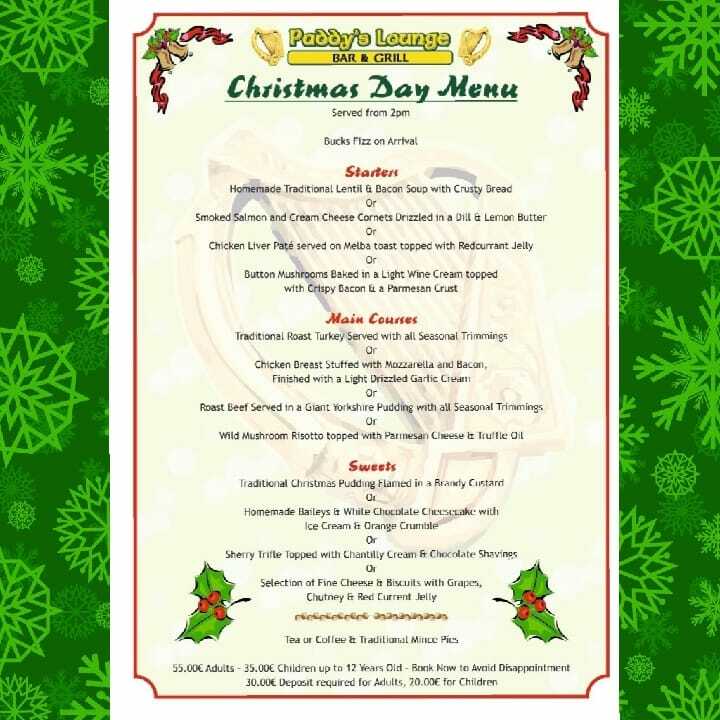 Restaurants will usually publish their Christmas menu on their Facebook page or their website at least a few months in advance, some starting from August or September. If you have a favourite restaurant in Tenerife where you'd like to go for Christmas dinner then you should ask them in advance or check their social media to see if they've announced anything. 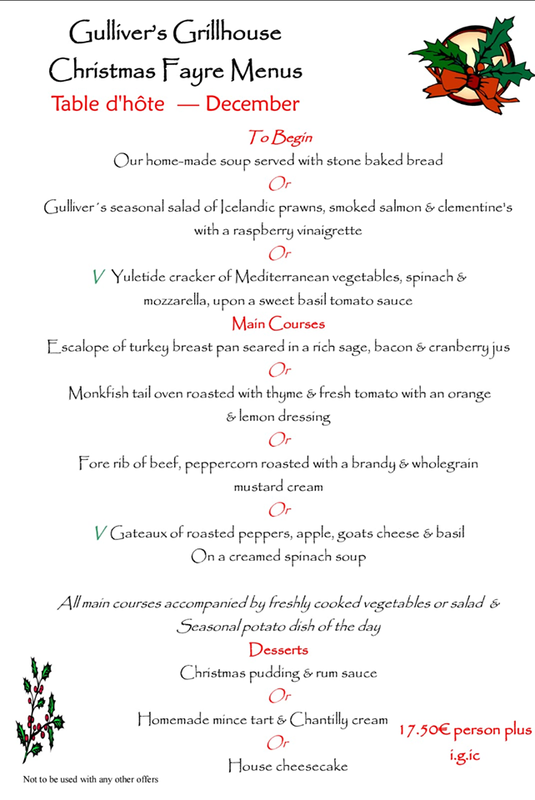 Regarding what's on the menu on Christmas day in Tenerife, it pretty much depends on what you'd like to have. You can choose anything from a traditional roast meal to a Chinese buffet or Spanish cuisine. Some restaurants will serve a traditional Christmas menu and others will keep business as usual and serve what they are usually serving. There's plenty of cuisines to choose from, so if you're spending a Christmas in a sunny destination like Tenerife you might as well try something new. The menu is 17,5 Euros per person, plus IGIC. The Tramps Tenerife Club will host a Christmas party every night of December. Christmas program in Los Realejos - see program for the entire month of December, up to the 5th of January. If the weather is nice, why not grab something to eat the day before from the supermarkets, a bottle or wine or cava and on Christmas day go to the beach and have a picnic there? If you're spending Christmas day getting a tan, you might as well take advantage of the sunshine and beautiful weather to get a really unique meal right in front of the ocean. You could always have a Christmas lunch on the beach and then go out for a fancy dinner.